I am running a Mindfulness 8 week course from the 5th August and still have some places left. The evening course will run from 7pm. We will be looking at Mindfulness and well-being. I’d love to see you there! Click here for more information, Email me at susan@mindingthesoul.co.uk or call (+44)01634 303617 / 07815 783250 to book a place. In mindfulness meditation we use the breath – this vital source – our life force as an anchor to bring us back to the present moment. Anchor in the present, moment by moment and enjoy your everyday miracles of the moment . Stay with the breath. Well-being is essential to our lives, it underpins how we live and the happiness we find. On Saturday at The Centre of Light I will be sharing two of the ways I have found well-being, and hope you can to. 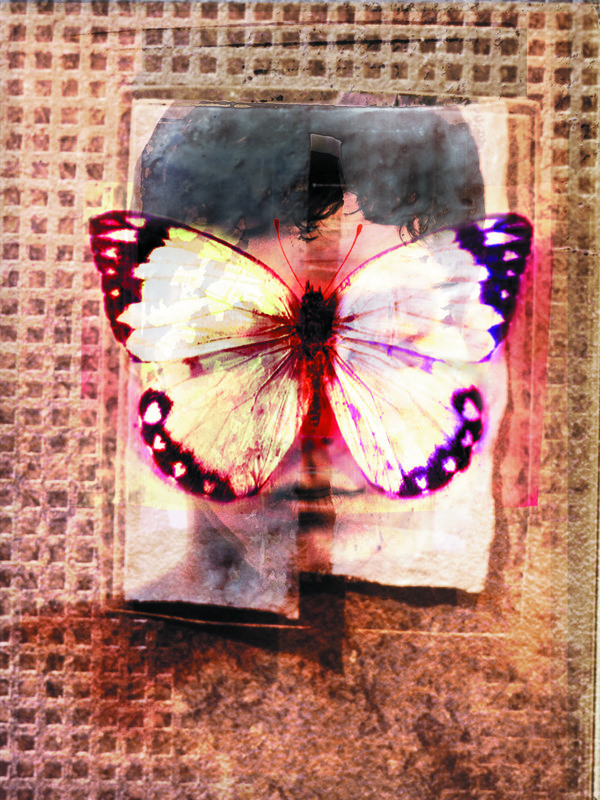 The morning will look at Hypnotherapy and Self-Hypnosis and the afternoon will explore Mindfulness. The afternoon will focus on Mindfulness. Mindfulness is another amazing practice that can improve your life. The workshop will cover meditation techniques too help you achieve peace and clarity. Whilst I can’t guarantee success in meditation I hope it will be an amazing journey letting you grow and develop. This is so true, I know only too well as a professional Hypnotherapist and Holistic Counsellor, how damaging yesterdays limiting beliefs can be. 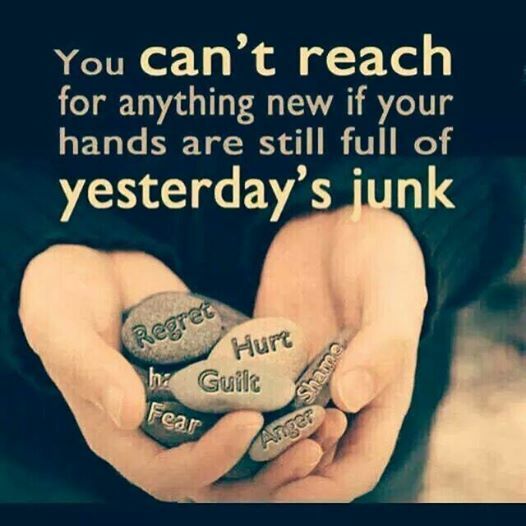 Working with my clients on a daily basis I see the damage that yesterdays JUNK can hold – FEAR …GUILT, REGRET, HURT, LIMITING BELIEFS, be aware of the limiting beliefs that you may hold and take steps to rids these from your life and set yourself free to live a happy and fulfilling life. Mindfulness Meditation Workshop This Saturday 9th August! I can’t wait for the workshop, and a chance to celebrate and share mindfulness! Interested? You will learn some meditation exercises to help with relaxation, breathing, concentration, stress reduction and clarity of mind. 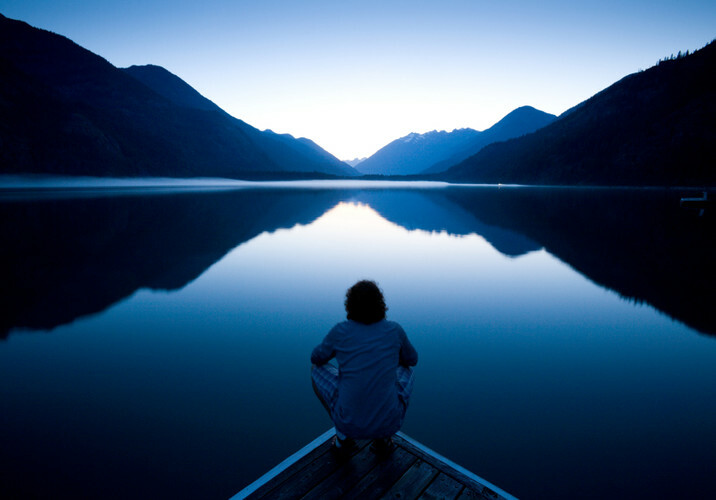 Mindfulness meditation is an amazing tool which has been passed down humanity from age to age for thousands of years. Mindfulness meditation gives the gifts of insight, breathing space, understanding, appreciation and freedom and it is because of this I believe mindfulness meditation should be a gift available to all. 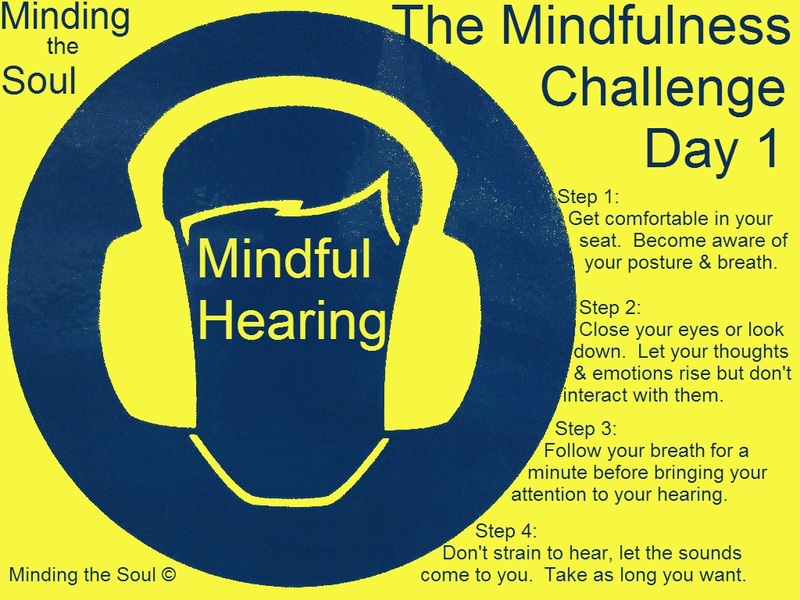 I want to share this amazing practice with you at my mindfulness meditation workshop whether you are new to it meditation or a regular meditator. I would be delighted if you wanted to join me Saturday the 9th of August between 10am and 1pm for a workshop on mindfulness meditation. I don’t promise to make you master meditators but I will show you the benefits of mindfulness meditation and how it can transform your life. During this workshop you will learn some meditation exercises to help with relaxation, breathing, concentration, stress reduction and clarity of mind. 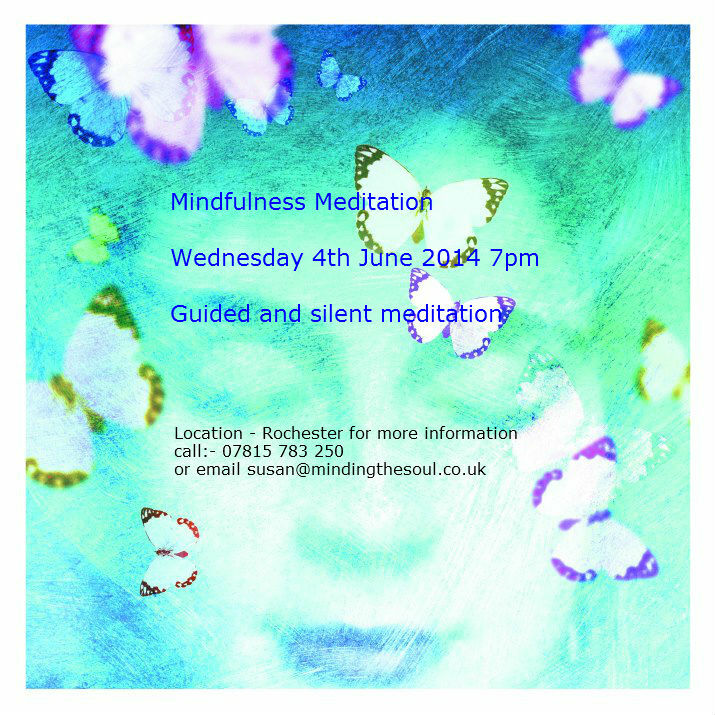 I’m excited to announce that this Wednesday (4th June) I will be running a Mindfulness Meditation evening from 7pm. I’m even more excited because this will be the first event in my new meditation space! The evening will explore what meditation is all about and will include several meditations covering guided and silent forms. My aim is to show you the benefits meditation can bring to your lives and no previous experience is needed, just a curiousity to learn and grow, although equally it will grow any experiences and techniques you may already have developed. I will provide chairs and mats but you are welcome to bring your own, as well as cushions, blankets, meditation benches, etc. I will also provide refreshments. The night will cost £5.00 and it would be a pleasure for you to attend and mark this special occasion with me. The address is The Farthing, Nashenden Lane, Rochester ME1 3JQ. Please email or phone me if you are interested on 07815 783250 or susan@mindingthesoul.co.uk even if you would just like more information. Inner peace is something we are all entitled to, but all feel at some time or another we have had to fight against the world to achieve. The first part of the problem is allowing the world to control and influence us right to our core. The journey towards inner peace starts with a choice, the choice to accept and use our own power over our lives. This is important because it sets the intention and the goal It gives us something to visualise and aim for in our lives – in every aspect of our lives. Once we have made this choice the next step is potentially harder, but no less vital. Trust. If we spend our lives doubting our abilities or decisions they will always be lacking. Beyond this though any inner peace you might have will be overwhelmed by doubt and insecurity. We all have the tools we need to tackle any life situation, all it takes is a little trust from ourselves. Judgements, both our own and others, can also block inner peace. Whether they’ve come from us or from someone else it is us who gives them permission to affect us. When anyone judges anyone they only judge based on their own life, they have no idea about anything else – making their judgements useless, and only as powerful as you decide you want to make them. Why does that make me feel like that? What does this feeling do to me? Why am I letting this happen? As we question ourselves we begin to understand what we’ve been doing to ourselves, and to break the circle of negative thoughts once and for all. Taking the experience as a lesson and being grateful for what it has taught you renders the experience less and less powerful until the memory is just another memory. Mindfulness, developed by Eastern cultures, especially by Buddhism, is another vital tool. 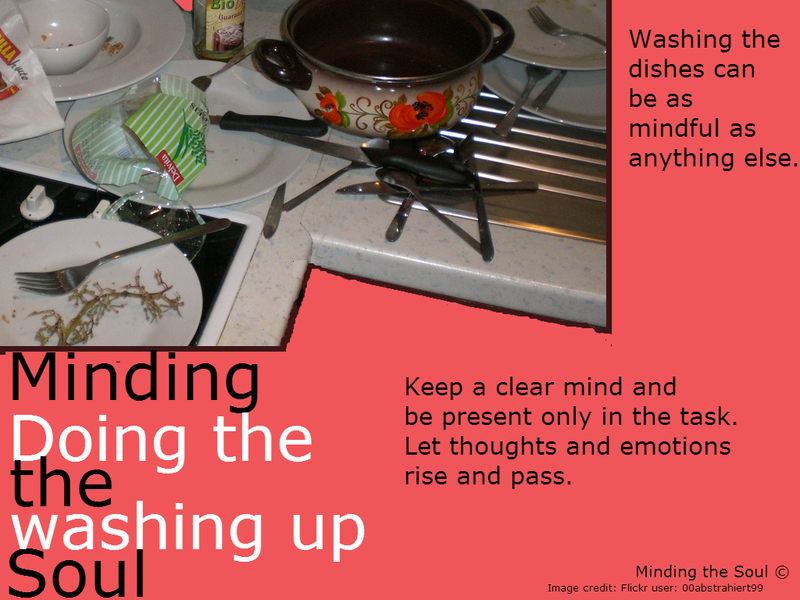 Doing things mindfully, giving yourself fully and only to the awareness of the task you are doing, gives you space away from pain and negativity. It gives you space but also time to reflect impartially on it as thoughts and realisations float freely through your cleared mind. As I have said previously gratitude is also an exceptional way to deal with negativity, letting us learn and grow – embracing all things with positivity. As we embrace our power over ourselves and remove the stumbling blocks we learn how to stop falling but bound high into inner peace and a life lived at our full capacity. I write to advise that my next 8 week Mindfulness Meditation Course for wellbeing is due to commence Thursday 6th March 2014, 7 pm – 8.30 – 9.00pm. It will be held in Rochester. Transform your everyday life into a more meaningful experience. Within this 8 week course I will provide a framework which allows the life-changing benefits of mindfulness and meditation to be assimilated and practiced in a way that can lead to lasting well-being, enhanced health and expanded consciousness. Mindfulness Meditation has been inspired by the East, most notably from the Buddhist traditions and is practised by people with different faiths or no faith at all. The meditation practise I teach while Zen based incorporates both the East and West elements including Eastern philosophies alongside Western research and studies. The course is structured in such a way that with each passing week and teaching you deepen both in to the meditation practice and yourself. There are also 4 guided meditation presented in CD format, a course manual at the end of the course together with an attendance certificate. If you are interested in this 8 week mindfulness course however and the dates and time are not suitable then please let me know as there are other people that have shown an interest in alternative days and times. The cost of the course is £200.00. 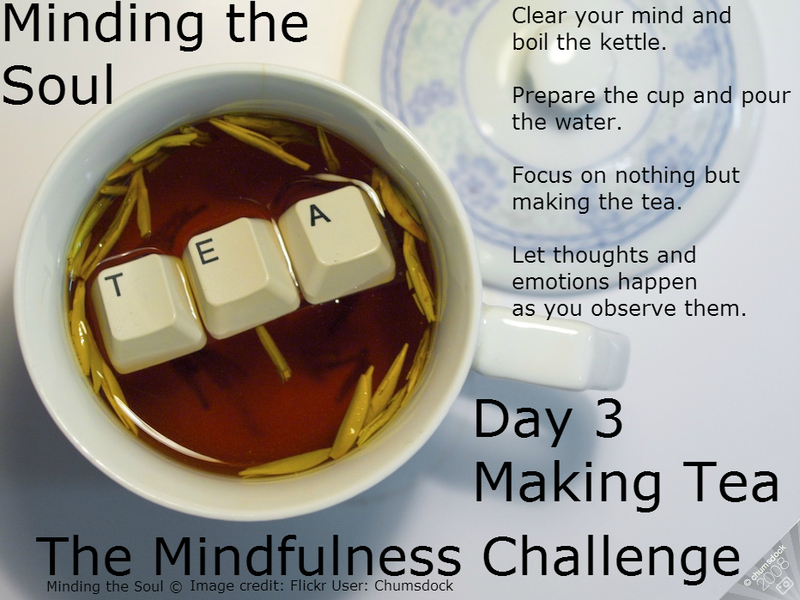 This is the final part of the Mindfulness Challenge. I hope over the course of the week you’ve enjoyed Mindfulness and living Mindfully. I also hope the space, peace and awareness it has given you as benefited you in all areas of your life. 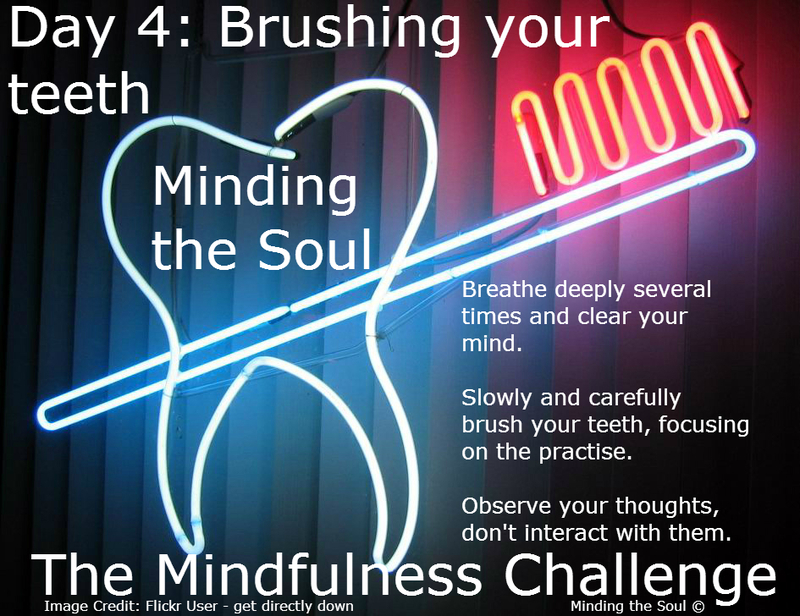 This challenge has looked at five areas but Mindfulness can be applied to all areas of your life. 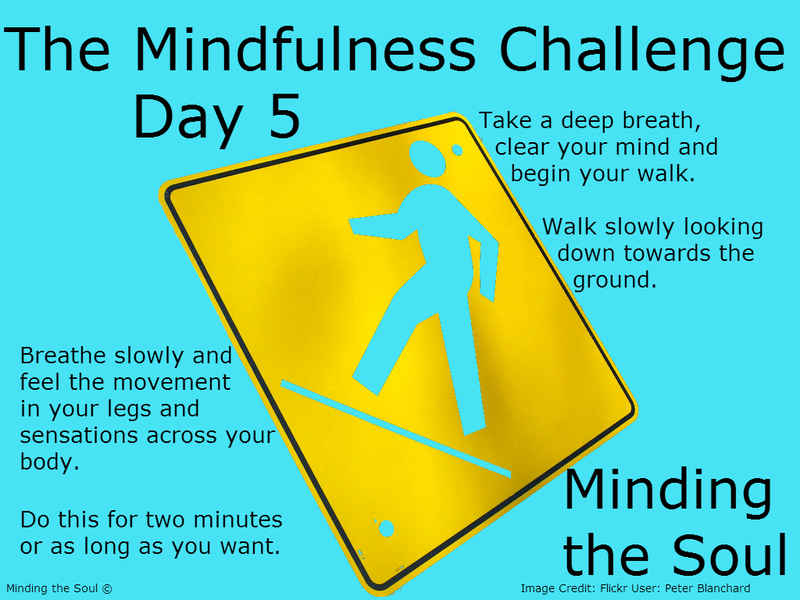 Mindful walking is a great way to explore yourself and the world around you. It allows you to step back from your thoughts or emotions and not only take a break from the day but to step out of the situation entirely. To walk Mindfully start by taking a deep breath, clear tour mind and then begin to walk slowly. Look towards the ground as you feel every step in your legs and the sensations experienced by your whole body. Do this practice for a minimum of two minutes but continue it for as long as you’d like.